Coat: Nordstrom (also love this one, this one and this bright one!) Corduroy Overalls: Free People. Sweater: Tippi. Shoes: Gucci. Sunglasses: Saint Laurent (I also bought them in red here). Scarf: old, similar for only $29. Fall is here, and today I am highlighting the cooler weather approved fall staples that I can’t live without – including a plaid coat, great pair of cords, cozy scarf, and of course all things PLAID! I’m always looking for fall staple items that are comfy enough to travel in, but also keep me feeling put together when I arrive at my destination. Thank you to ShopStyle and Nordstrom for sponsoring this post. I mean, is it even really fall until you’ve worn a plaid coat? These fantastic four are a few of my favorite current plaid pieces from Nordstrom. From an exploded plaid, to a more micro plaid, and everything in between. These coats pull double duty – super classic but also eye catching. I will take one of each color please. Corduroy is the perfect unexpected way to add subtle color into a fall look. Come cooler temperatures, I find myself swapping out denim for comfy non-traditional cords. Above I am wearing cord overalls, but I am also loving the wide leg crops. At just $80, they are perfect back to sneakers, a classic loafer, or even a pointy bootie! SCARF SEASON! Wrap me up in blanket scarves all season long. These four are my current favorites available from Nordstrom. While I love pops of color in my wardrobe, I find myself embracing neutrals much more in the fall. Much more than any other season in fact (don’t worry COLOR is still my jam)! 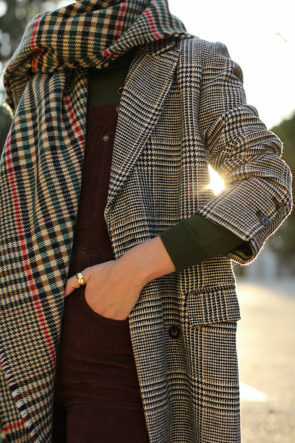 I love pattern on pattern, and a plaid blanket scarf back to a plaid coat is fall pattern mixing perfection! Always a beautiful look … love ♥️the oversized scarf, such a great accessory to the outfit. That coat is gorgeous!! For sure a fall staple! The suitcase actually compliments this look. Love the coat! Such a simple style, but gorgeous! Those corduroy overalls are so cute. Great tartan coat as well. You look phenomenal. Love your outfit here – so gorgeous! Your outfit is lovely. Plaid is a great print for fall. Love this warm and cozy look, perfect for all of the travel you have been doing! I’m obsessed with your outfits! I love this outfit and the colors!